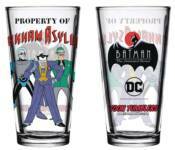 Celebrate twenty-five years of Batman: The Animated Series with Popfun's new line of pint glasses based on the series! Featuring artwork of the series characters as well as the iconic art deco-styled logo, these glasses are perfect for display or use! Choose from Arkham Asylum, the Bat-Family, Batman & The Joker, Batman & Two-Face, Batman, Christmas with the Joker, Gotham City Sirens, or Mad Love designs.